A fishing trip to Khao Laem Dam in Kanchanaburi Province saw the team arriving in an absolute downpour. Heavy rains did not deter the anglers who quickly boarded a longtail boat before starting to explore the gigantic reservoir. The anglers visited several likely looking holding areas making a series of casts towards sunken trees and submerged root systems. With the heavy rains making the fishing extremely uncomfortable the anglers returned to the comfort of their floating bungalow to wait for the weather to change. Two hours later the rain had almost stopped allowing the anglers to resume their exploration of the lake in earnest. After quietly stopping the engine and paddling the boat into position with an oar the anglers began to make exploratory casts towards the nearby fallen trees. Immediately a fish was seen to follow the surface popper as it was gently retrieved past the submerged branches, pulling away at the last moment and sinking back into the depths. Repeated casts towards the snags eventually resulted in a savage strike as a large Giant Snakehead aggressively hit into the lure! With the fish diving deeply in an attempt to enter the sanctuary of the nearby snag full side strain was applied causing the fish to swim into open water. The snakehead made several more powerful runs before it was finally gloved alongside the boat. 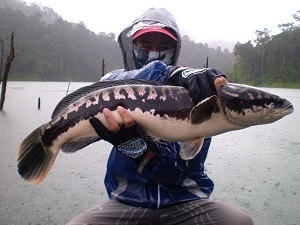 The Giant Snakehead was weighed at a satisfying 5.1kg’s and was photographed just as another wave of rain descended on the lake. With weather conditions looking unlikely to improve the anglers decided to continue to fish. Steadily motoring through the rain the anglers soon found another prospective holding area. Mooring the boat up at the side of a wide bay the anglers once again began to make a series of casts covering a wide swathe of the bay. Several sunken trees were observed to be protruding from the waters surface in the centre of the bay indicating a possible holding area. Repositioning the boat saw the anglers making long casts towards the sunken forest in an attempt to produce a take. After a number of casts with surface lures the anglers changed over to sinking lures in an attempt to fish lower down in the water column. On only the second cast the surface erupted as a Giant Snakehead attacked the sinking lure with lightening speed. A relatively short battle followed which saw the snakehead attempt on several occasions to enter the mass of underwater branches. Ohm skillfully played the fish away from the danger area before scooping the fish up in the landing net. 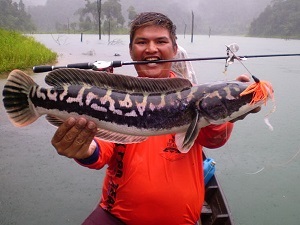 The Giant Snakehead was weighed at a weight of 3.2kg’s before being released back into the reservoir. The anglers continued to fish throughout the afternoon accounted for three more snakeheads with Giant Snakehead of 2.4kg and 2.5kg and a Striped Snakehead of 1.3kg’s.